Participatory Budgeting: Catch the Fever! 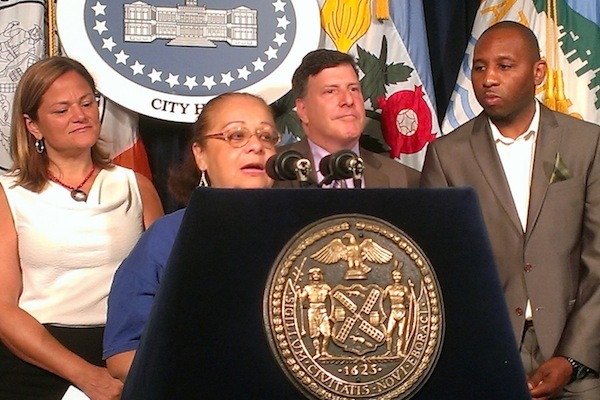 Agnes Rivera, Member-Leader of Community Voices Heard, at the City Council Press Conference on the Expansion of PBNYC to 22 Districts. She&apos;s joined by, from left to right, Council Speaker Melissa Mark-Viverito, Councilmember Mark Weprin and Councilmember Donovan Richards. A public housing development in the South Bronx. A senior center in East Harlem. A farmers market in Greenpoint. A community organization office in Red Hook. A street corner in Sunset Park’s Chinatown. A public school in Kensington. A church in The Rockaways. What do all these places have in common? They were all voting sites for Participatory Budgeting NYC (PBNYC) back in April when nearly 17,000 residents from across 10 NYC Council Districts came together to vote on how to spend over $14 million in City funds. PB is a powerful community decision-making process that was sparked by the Workers Party in Porto Alegre, Brazil in 1989 and is now being utilized in over 1,500 cities around the world. Community Voices Heard (CVH) first heard about participatory budgeting back in 2002 when a small delegation of members attended the World Social Forum, an annual meeting of civil society organizations bringing together non-governmental organizations, advocacy campaigns, as well as formal and informal social movements seeking international solidarity. CVH members attended workshops about PB in Brazil and our interest was sparked. We found it hard to believe that there was a government that allowed the PEOPLE to decide how public monies were spent, but we were impressed. It seemed like the way it ought to be if transparency, engagement and equity were to be at the core of government. But, this was something of dreams, we thought; not a real possibility for NYC. And yet, in 2011, four daring City Council members—Melissa Mark-Viverito, Brad Lander, Jumaane Williams, and Eric Ulrich—decided to partner with CVH and The Participatory Budgeting Project, along with an array of other community partners, to initiate a pilot project in NYC. Now, only three years later, 22 Council Members have taken up the challenge—committing at least $25 Million to a public vote—and central Council staff and resources now support the process. PB “fever” has hit NYC and a new way of governing is now being institutionalized. Participatory Budgeting allows ordinary people to directly decide how public monies are spent. Through a multi-month engagement process, people come together to brainstorm ideas, develop project proposals, interface with city agencies to determine costs, present ideas back to their community, and vote on projects that make it to the ballot. With real money on the table and expanded rules about who can vote, PB even inspires traditionally disenfranchised populations to engage. In fact, expanding civic engagement and developing new community leaders is one of the explicit goals of the initiative, and empowerment and inclusion are explicit principles. Research on the process carried out by the Community Development Project at the Urban Justice Center demonstrates that the diversity of NYC is being represented in the process and new people are getting engaged: two-thirds of PB voters were women; 60 percent identified as people of color; 49 percent had less than a college degree; nearly half have household incomes less than $50,000; 32 percent were born in another country; 22 percent of ballots were cast in a language other than English; almost 70 percent had never worked with others in their community to solve problems; and 22 percent of PB voters identified barriers that made them ineligible to vote in traditional elections. We all live side by side in our communities, and all of voices should count. With young people ages 16 and up, undocumented immigrants, and the formerly incarcerated all able to vote in PB, the electorate is being expanded and new voices are being brought into the process of governing. A fully inclusive and equitable process, however, takes work. If PBNYC is going to continue to hold true to our founding vision and principles, we need to constantly challenge ourselves and our government officials to do better. Energy and resources need to be dedicated to ensuring that the process is accessible for all New Yorkers. Extra efforts are needed to advance inclusivity. And new tools need to be created to make sure that resident committees are well equipped to evaluate projects through a lens of equity and prioritize those that meet the deepest needs. There are plenty of challenges we’ve already met along the way—particularly given the limited resources on hand for implementation of the process—but the beauty of PB is that each year we can improve upon the process and make sure that everyone has a voice and agency in doing so. People not only have a vote, but can also contribute to making the process itself better if they’re willing to pitch in and work towards it. The expansion to 22 districts this week is monumental, but the possibilities shouldn’t stop here. CVH has a long-term goal of seeing significantly more resources to be allocated through PB processes. Imagine if all City Council Members allocated the majority of their discretionary funds through PB, as is done in Chicago. This could boost the pot of money from $25 million to $250 million. Now that Council Members know the amount they’ll have to work with—due to recent rule changes and a more equal distribution of resources—there is less risk associated with dedicating more resources to the process. Imagine if discretionary expense funds, which support programs and activities and not just physical projects, were also allocated through a PB process? What kinds of ideas and priorities would emerge then? Imagine if NYCHA set aside money like Toronto Community Housing does, and public housing residents gained the right to determine how best to address their needs and build community in the process. Or if resources were set aside for a youth PB process——like the Mayor of Boston initiated last year—so the next generation of civic leaders could be inspired. What if the Department of Education initiated a PB process to inspire more parental engagement as students, teachers, and parents worked together to determine their budgetary priorities collectively? The only way we’re going to counteract people’s apathy in civic life is if we give people real power and value their voices. PB offers a new way of governing that validates people and their experiences in a transformative way. It just takes a willingness to do things differently, and an openness to reimagine our connection to our neighbors, our communities and our government. Catch the “PB fever” and you’ll see! Delegates in Councilwoman Melissa Mark-Viverito&apos;s district had to get savvy about how to get the maximum out of their million. So they expanded the scope of potential projects and limited the number they&apos;d consider. Kensington: What Price a Dog Park? In Councilman Brad Lander&apos;s district, citizen budget delegates learned quickly how expensive simple projects can be. But they also found much could be accomplished without spending a dime. The first public hearing of the mayor&apos;s Charter Revision Commission could be the start of a fast-track effort to change the way New York City governs itself.